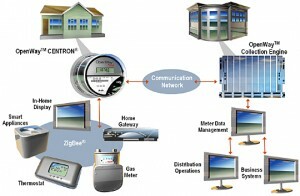 Wireless smart-grid solutions become ever more important with raisin energy costs. A smart grid is a digitally enabled electrical grid that gathers, distributes, and acts on information about the behavior of all participants in order to improve the efficiency, importance, reliability, economics, and sustainability of electricity services. Roll-out of smart grid technology also implies a fundamental re-engineering of the electricity services industry, although typical usage of the term is focused on the technical infrastructure. The smart grid represents the full suite of current and proposed responses to the challenges of electricity supply. Because of the diverse range of factors, there are numerous competing taxonomies, and no agreement on a universal definition. Numerous contributions to overall improvement of the efficiency of energy infrastructure is anticipated from the deployment of smart grid technology, in particular including wireless demand-side management, for example turning off air conditioners during short-term spikes in electricity price. The overall effect is less redundancy in transmission and distribution lines, and greater utilisation of generators, leading to lower power prices.